If you like the My To-Do List app please contribute to the beer fund! 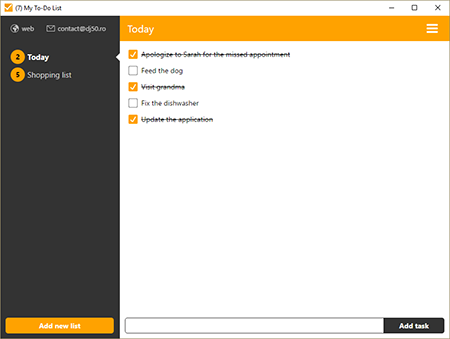 "My To-Do List" helps you organize your life, by providing you with a simple and intuitive task list. You can add many tasks quickly, arrange them by dragging them up or down and also edit and delete them by clicking the corresponding icons. Write your task in the field at the bottom of the Window and click [ADD] or press ENTER. Hover over a task and click on the trashcan icon next to it. Hover a task and click on the pencil icon next to it. Edit the task and press ENTER or click away to save it. Switched from Pokki to Electron. Now the app is standalone.